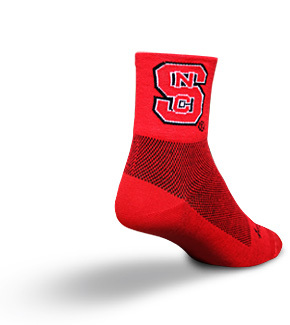 NC State Cycling Socks with Free Shipping. CycleGarb is proud to offer these beautiful Officially Licensed NC State Wolfpack Cycling Socks. These collegiate socks are made with 75% Ultra-wicking Micro Denier Acrylic, 15% Nylon, and 10% Spandex for exceptional comfort and strength. They feature a "stretch-to-fit" sizing system and a "easy-fit" cuff for a PERFECT FIT every time on any foot. These features create superior softness and comfort and help eliminate blisters and hot spots. We also feature a double stitched heel & toe for added strength and durability. The NC State Wolfpack Cycling Socks are typically shipped in 1-5 business days.